Restaurants are an institution in nearly every country and every culture in the world. The restaurant as we know it today, a place where people come to eat and drink and socialize, is credited to the French Revolution. But even before Marie Antoinette and Louis XVI were sent to the guillotine, restaurants had been around in one form or another for thousands of years. Since the 20th century, restaurants have undergone significant changes, in part to technological advancements in food productions. Today, there is a movement in many restaurants for a return to the farms, placing greater emphasis on local goods. It’s no coincide the growth of restaurants through history correlates with the growth of cities. The need for public eateries was firmly established as far back as the Roman Empire and ancient China when peasants brought their goods to the markets, often they traveled for several days at a time, stopping at roadside inns along the way. Usually located in the middle of the countryside, inns served meals at a common table to travelers. There were no menus or even options to choose from. Every night was chef’s choice. In Europe throughout the Middle Ages and into the Renaissance, taverns and inns continued to be the main place to buy a prepared meal. In Spain, they were called bodegas and served tapas. In England, items like sausage and shepherd’s pie were popular. In Germany, Austria and Alsace brauwin and weisteben were typical, while in France stews and soups were offered. All of these early restaurants served simple, common fare—foods you would find in a peasant or merchant home. In France throughout the Middle Ages, guilds had monopolies on many aspects of prepared foods. For example, charcutiers were the guild who prepared cooked meats for sale therefore if you didn’t belong to that particular guild it was illegal to sell cooked meat in any form. Following the French Revolution, guilds were banned and many chefs employed in aristocratic, even royal, households found themselves unemployed. Many of these displaced workers opened their own restaurants in Paris, bringing with them a new way of dining. Delicate china, cutlery, and linen tablecloths—all trappings of aristocracy, were now available to a whole new echelon of French citizens. Menus became more diverse, offering both prix fixe and a la carte. Though public houses continued to exist, the rise of fine dining in France would soon spread throughout Europe and into the New World. During the 19th century, the number of restaurants in Paris continued to rise. After the defeat of Napoléon, wealthy Europeans flocked Paris to partake in the many gourmet dining options. It was especially true of the allied officer gentlemen—a move that would be repeated following the end of WWII. With the discovery of germs and the link between health and hygiene, a greater emphasis on cleanliness led to the rise of two popular hamburger chains in the early 20th century: White Castle and White Tower. Their all-white interiors were meant to reassure customers that their food was prepared in a safe, modern, sterile environment. However, the biggest change in the restaurant industry during the 20th century is credited to McDonald's. Originally a hot dog stand owned by two brothers from Illinois, they switched to hamburgers in 1948. Taking a cue from Henry Ford’s assembly line concept, the McDonald brothers began offering the fastest, cheapest food possible by employing low skill workers to assemble it. While the brothers were successful at serving food efficiently and inexpensively, they were not so good at franchising. A restaurant equipment salesman by the name of Ray Kroc saw the potential in the McDonald's concept, buying the brothers out in 1954. His formula for franchising set a precedent for fast food chains, changing the landscape of American dining. 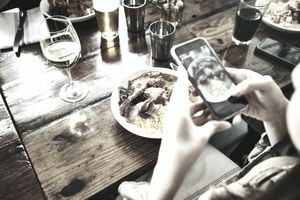 By the 1990s, with many families headed by two working parents, shifting consumer patterns brought an increase in the number of people eating out. Restaurant chains like Olive Garden, Applebee’s, and 99 catered to the ever growing middle class, offering moderately priced meals and children’s menus. Another modern trend is local foods, with special emphasis on sustainability. Today, people are more aware than ever of the link between health and nutrition and are more cognizant of what foods they are eating when they dine at restaurants.